When the first half-inning of Savin Hill Challenger baseball ended on Sunday afternoon, the pitcher, Billy Farrell, lingered on the mound for a good, long minute. A long-time civic leader and volunteer coach from Meeting House Hill, Farrell had just watched the bases cleared on a base hit by an autistic boy from Dorchester— Xavier Bell— who had never before stepped onto a ball field. For a gallery of photos from Sunday's opening game, click here. Like all of the players, some of whom have lost limbs or use wheelchairs due to conditions like cerebral palsy, Xavier had help from a “buddy” named John Joyce, who helped him swing the ball into play and then run to first base. Among those who scored on Xavier’s single was eight-year-old Jane Richard, who lost her leg in last April’s marathon bombing that took the life of her brother Martin. Jane’s dad, Bill Richard, beamed from the first-base line and took photos of the action. The Martin W. Richard Charitable Foundation— which Bill and his wife Denise set up to honor the memory of Martin – is a major sponsor of the league. The $10,000 donation is the first awarded by the charity, which has raised more than $1.25 million since it was launched earlier this year. The reasons for choosing Savin Hill Baseball— and the Challenger division— as the “first act of giving” by the foundation are “obvious but powerful,” Richard explained. “Martin loved sports, especially baseball, and he played at Savin Hill Little League. Jane is now working very hard to overcome her own physical challenges and as a family we are all-in in helping her and others have the same experiences as other kids,” said Richard. 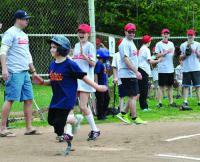 The Challenger division is up and running, thanks to Brendan McDonough, a Savin Hill resident whose seven-year-old daughter Sophia is also playing for the Astros. McDonough has founded Project BIND, a program for non-typical children at the Boys and Girls Clubs of Dorchester, and Project DEEP, the successful tutoring and high school prep program based in Neponset. Both programs are partners in the new six-game baseball season. About 65 volunteers have signed up to assist as buddies and coaches. McDonough says 29 kids are registered as players— most of them between the ages of six and twelve. Next year, McDonough believes, the league will double its numbers to four teams, with two age brackets. The generosity of the Martin W. Richard Foundation means that the kids have shirts, equipment, and refreshments throughout the year— and trophies that await at the end of the season in June. The Shaw’s supermarket company has chipped in with a $800 donation of water and Italian ices for the kids during each game. “We have a good core nucleus of 30-40 volunteers per game so that every kid has a buddy, with infield coordinators, bench coaches, two people at home plate and someone running with each kid,” said McDonough. The Challenger Division will play its games on Sundays through the end of June. There are no games over Memorial Day weekend. Savin Hill Little League will sponsor a Block Party on Saturday, May 31 at their home field— McConnell Playground next to Savin Hill beach. The family-oriented event will include baseball games, along with bouncy-castles, an inflatable obstacle course, pony rides, dunk tank and more. Food from local restaurants will be available at the field. The event will begin at 10 a.m. with a parade of players from the various Savin Hill Little League divisions. An after-party for adults will be held later in the evening at Savin Bar and Kitchen. The event will also include “cow plop”— in which the winner will split the proceeds of square sales fifty-fifty with the league. The league hopes to sell 200 squares, netting the winner and the league $5,000 each. “We want to get the community together and showcase how far the league has come,” said organizer Joe O’Malley. “It will raise money for the league, but it’s more of a community event and Dorchester Day weekend is the perfect time." Tickets for the cow plop will be sold by coaches and board members. More information is available online at savinhilllittleleague.org or visit their Facebook page.